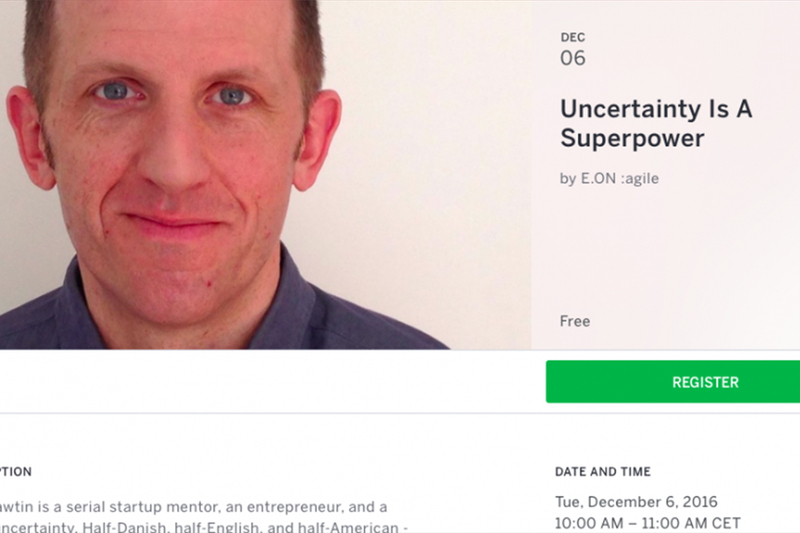 Nick Hawtin is a serial startup mentor, an entrepreneur, and a fan of uncertainty. Half-Danish, half-English, and half-American - and very happily based in Copenhagen. Starting something new requires making a lot of decisions on the basis of incomplete and often conflicting information. This uncertainty can be confusing and for many it is disheartening, but uncertainty is good. Uncertainty is a superpower. Any fan of superhero movies can tell you that superpowers are not always used for good and not everyone with a superpower masters it. You can, but it takes a series of conscious decisions to do so. If you embrace uncertainty and learn how to operate within it, what surprises others will present you with opportunities. These opportunities seized will give you a major advantage. Some will even think you can see around corners. The truth will be much simpler. You will have chosen to accept what you can't control and learned to take advantage of it. The talk will give concrete examples and focus on how to apply these principles immediately. This talk is in partnership with E.ON agile.